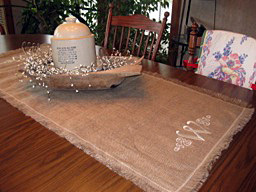 Burlap, the unexpected fabric that is quickly becoming all the rage! 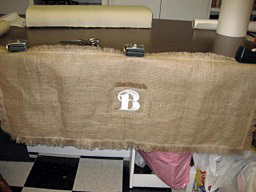 All burlap products feature a double-layer of the fabric to give it more body. 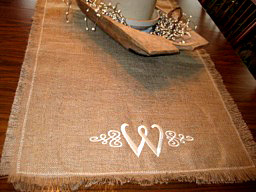 A specialty topping is also added to the burlap to ensure that the embroidery does not "sink" into the loose weave of the material. Due to the customization options available, these new items are in demand with many of my customers. I have made this design for a recent engagement party, a married couple's re-affirmation of wedding vows, and an actual wedding. It has been very, very popular! 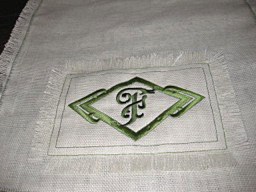 The striped effect on the appliquéd letter is achieved by using variegated embroidery thread. The colors can be changed to suit your desires. And, a personalized message or date can be added in lieu of what is shown. 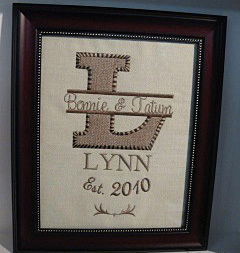 If you are in our area, come on by and see these stitcheries in person. 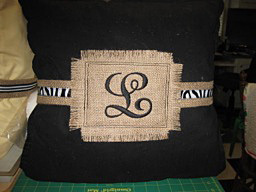 The photo here features the split letter stitchery (from above), made into a 14-inch pillow. 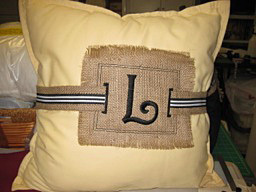 I again used a double layer of burlap and a velcro closure on the reverse side. Depending on the size of the design used for the pillow, larger pillows may be necessary. I have found that 16-inch or 18-inch pillows give the best effect. 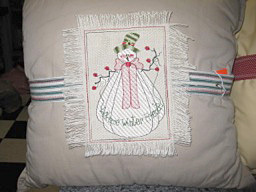 Estimates for larger pillows / stitcheries available upon request. 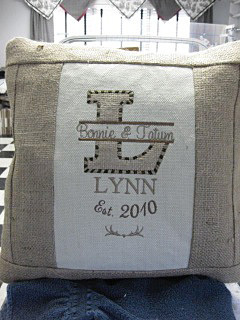 These burlap pillow wraps work best with 16-inch to 20-inch pillows. Naturally, I will need to know your pillow dimensions prior to beginning your project. The center, fringed square measures about 6-inches and can feature digitized button holes to run the straps through or the straps can be stitched directly to the square. Here you will see zebra-print ribbon and striped ribbon used; or, I have other choices available. I can create exactly what you need to accentuate your home decor. Here's a thought. These wraps may be used over existing pillows you already own! 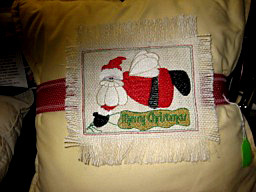 These pillow wraps were very popular during the December 2013 Christmas season. They are ideally made for 16-inch to 18-inch pillows. 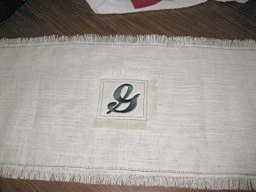 This photo group features a table runner with a centered, fringed, monogrammed square. 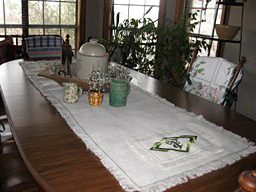 The entire table runner measures about four feet long. 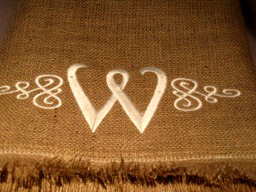 You may choose from two available burlap colors (traditional tan or creme), a thread color and a font style. 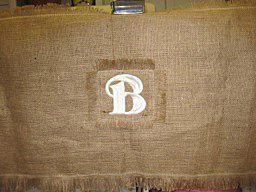 And, yes, again, I use the double layer of burlap for extra body. This photo group features two 4-inch monograms with side swirls (extra fees apply), and both monograms placed at opposite ends of the table runner. 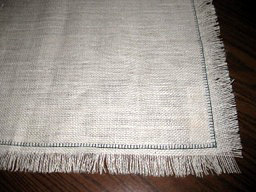 The entire table runner measures about six feet long, with all the "“bells and whistles", fringed edges, etc. This photo group features a much larger monogram style with a bold outer frame design. 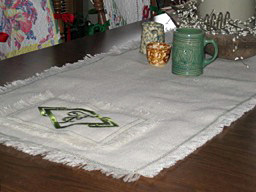 These photos show the personal version I use in my home. 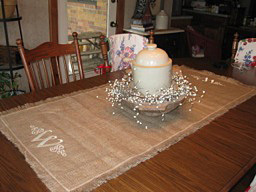 To accommodate our large family dining table, I cut the creme-colored burlap six feet long. 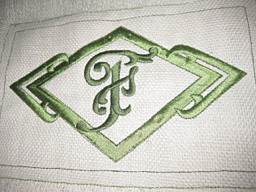 Two shades of apple green thread were used for both the monogram and the decorative stitching. If you are interested in a version similar to this one, I will be happy to provide an estimate for you.